There are many products in the market tailored for specific network needs and unfortunately, they cannot be used interchangeably as some other kind of network device. TP Link has broken this trend with the TL-WA5110G which is a router, WISP client and an access point all rolled into a single box. This high power wireless access point is perfect for Small Office / Home Office setups and other small businesses. Wireless Specifications: This single band access point supports wireless b/g standards. Working in the 2.4 GHz range, this device can support speeds of up to 54 Mbps for clients using the 802.11g standards and up to 11 Mbps for clients on 802.11b. The output transmit power for this device is boosted to increase the coverage area. The receiver sensitivity is also increased to capture signals from the remote devices in a reliable fashion. The device can also be used for long range wireless deployments as far as 50 kms. The device also provides wireless client isolation where two devices connected over the WLAN cannot establish a direct point to point link to share information. It supports PPPoE and well as DHCP and static IP configurations. As a router, it supports NAT and built-in DHCP server. It can support static routing and VPN pass through features. It also provides for DMZ and virtual servers making it a true enterprise solution. Wireless Security: The device provides WEP (Wired Equivalent Privacy) and WPA (Wi-Fi Protected Access) wireless encryption standards. In WEP, the TL-WA5110G supports 64-bit, 128-bit and 152-bit keys that are great for securing the wireless networks. However, being a weak standard, this is not usually recommended. The WPA/ WPA2 solutions are more secure and in the enterprise they can be used in conjunction with RADUIS servers too. With the WPA-PSK and WPA2-PSK solutions the device also supports advanced encryption standards providing for very high degree of security. It also supports MAC Address filtering that ensures that devices are granted access based on their MAC addresses. SSID broadcast disabling helps prevent unintended clients from trying to access the network. Operating Modes: Being a multipurpose device, it can be configured in many different ways. Given below is a brief description of various modes. AP Client Router: In this mode, the device acts as a client for the WISP (Wireless Internet Service Provider) network. The device connects to the WISP network over the air and provides internet connectivity to the other devices connected to it internally. AP Router: This is the simplest and commonly used mode for most wireless routers. 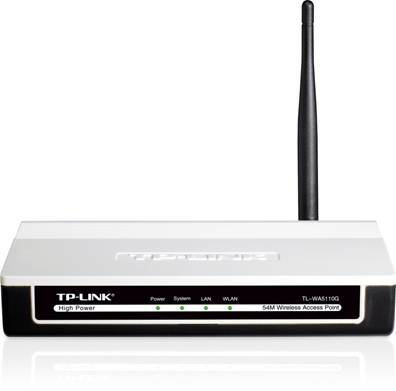 TL-WA5110G connects to the broadband modem over Ethernet and provides a wireless LAN for other devices to connect to it. In this mode, it supports features like firewalls, DHCP server, etc. Repeater: In this mode, the device plainly repeats the signal from another access point. The other access point becomes the root and the repeater mainly extends its reach further. In this mode the WDS is enabled. Universal Repeater: This is very similar to Repeater mode, except that the WDS is disabled. Point to Point Bridge: In this mode the device bridges two wired LAN segments over the air. Any access point configured in this mode can only connect to one other access point. Point to Multipoint Bridge: In this mode the device can connect with multiple (up to 6) access points. If it is configured with AP mode, it can also connect wireless devices; else it can only connect wired LAN segments over the wireless LAN. Configuration Setup: While the device supports remote management, one of the simplest means of accessing the setup is using the web browser. The default IP address of this access point is 192.168.1.254. To access this setup, the computer connecting to the device must have a static IP address in the same subnet, sat 192.18.1.251. The setup menu can be accessed by typing in http://192.168.1.254 in the browser URL. The username and password for logging into the device is admin. The first screen that gets displayed is the quick setup. Click on Next button to decide how to configure the device or its operation mode. Follow the Quick setup prompts to complete configuration.